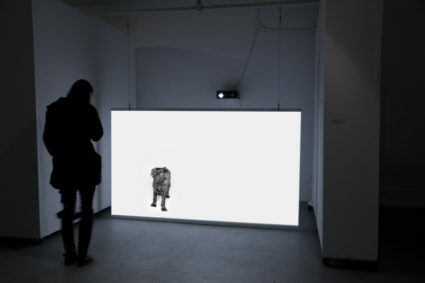 Wait explores the human-companion species relationship, using installation techniques of computer vision and interactive video. 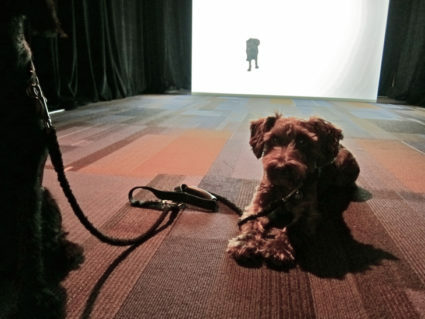 As a gallery visitor enters the installation space, a life-size video projection shows a dog walking towards the visitor. If the visitor continues to stand in position, the dog will also stand and wait, observing the visitor. If the visitor turns to leave, the dog also walks away. In Wait, the canine is presented in relational tension with the human. The visitor may be compelled to ask: “What is the dog thinking?” “Why is he waiting?” Human states of consciousness are brought to bear in relation to the canine gaze. 2011 “Animal Influence” Interactive Futures ’11: Animal Influence, Gallery Gachet, Vancouver. Curated by Carol Gigliotti. Andreyev, Julie and Simon Lysander Overstall. “Wait“, Leonardo, Special Issue Volume 44, Number 4, ACM SIGGRAPH, MIT Press, Leonardo/ISAST, Cambridge, MA, US.